Click Here To See Amazing Spider-Man Annual #15 Comic Book! Check out this incredibly detailed 1981 Amazing Spider-Man cover which was penciled by the great Frank Miller, and inked by the great Frank Miller inker: Klaus Janson, from the story titled: "Spider-Man: Threat or Menace?" 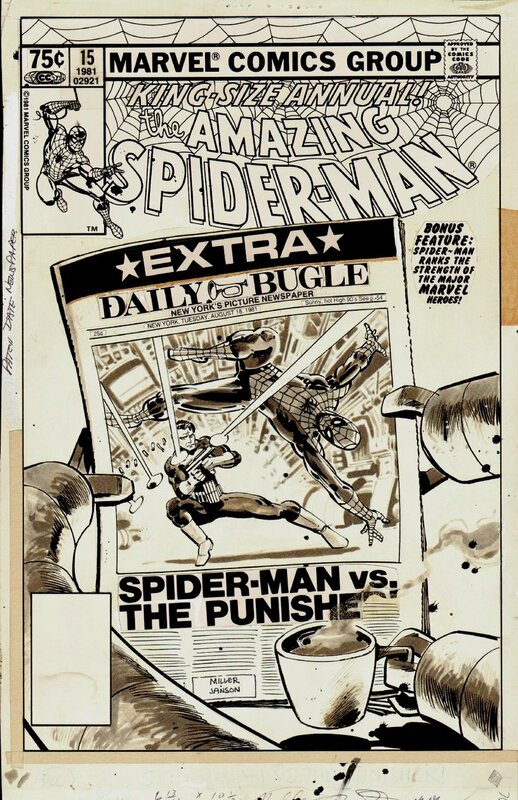 This nice cover was drawn on Duo-tone board to give it a great gray tone look, featuring Dr. Octopus having his morning cup of coffee while he reads the Daily Bugle which futures a full front page scene of Spider-Man dodging bullets from the Punisher, as he shoots at Spider-Man! Just a great "RARE" 1981 Frank Miller/ Klaus Janson AMAZING SPIDER-MAN cover, which came out the same exact month that Frank Miller and Klaus Janson were in their DD heyday drawing their ever classic Daredevil #171 issue! 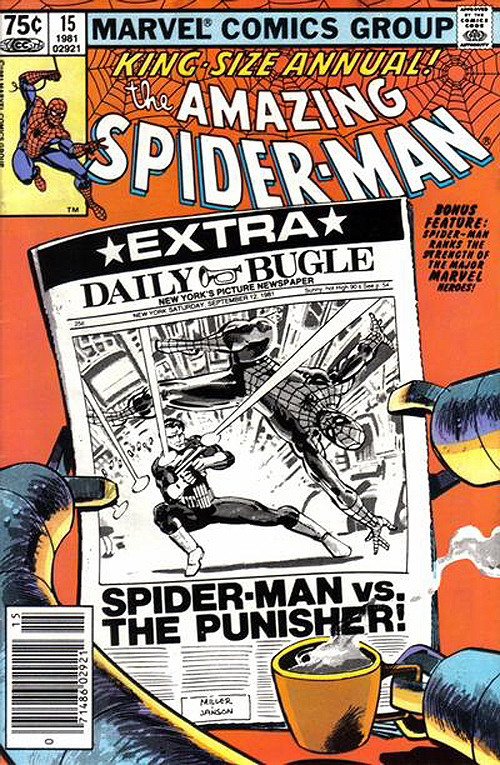 As an interesting extra tidbit to this GREAT cover....the original stat logo and all around the drawn cover, Either Frank Miller or Klaus Janson but ink drops along the lower part of cover and in the logo area and spider-Mans stat body simulating BULLET SHOTS through the cover, which were taken out for the final comic book image. Compare this nice cover art to the published comic book in the red link above! ALL HIGH end pieces of art, including this one, are able to be purchased with VERY fair time payment plan options, and trades are always considered towards this and "ANY" art on our website! Just send us an email to mikeburkey@aol.com and we can try to work something out.